Na Na Na Na Na Na Na Na Nu-uuuuns... - You don't know me. Seriously. Haha. I wanna go!!! Wow! I would like to see that too. Mother Superior is sitting quietly in the convent garden when her prayers are interrupted by a heated argument between two nuns. She listens for a few minutes, but when it becomes apparent that they won't come to their own solution she closes her book and walks over to them. "I've heard enough!" she snaps. 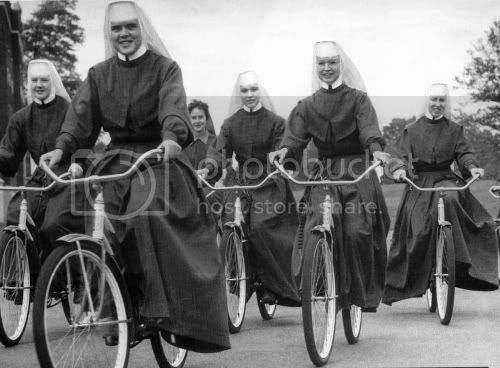 "Sister Mary, you may have the bicycle Tuesday and Thursday mornings from nine to noon. Sister Catherine, you may have the bicycle Monday and Wednesday afternoons from one to four. Now not another word or I'll put the seat back on!" This reminds me of the smiling nuns with shotguns. I wonder if they're from the same photo series. No nuns in my photo inventory, but a couple of nice church shots: www.waynewestphotography.com. LOTS of observatory photos, but being married to an astronomer gives me an access that I ruthlessly exploit. That's awesome! I like your medical series too. Unexpected, but fascinating! Thank you. I'm not that great at throwing things out, and I recognized that my medical supplies could make cool props, so I saved some of them. Then I took an advanced photography class that required us to use a theme: viola, medical! I'm quite happy with how they turned out.